Broadford, a rural township, adjoins the Hume Freeway a short distance beyond the Dividing Range. It is 70 km north of Melbourne and 25 km south of Seymour. Broadford is on the Sunday Creek, which had to be crossed by persons travelling from Kilmore to the north-east of Victoria. It is possible that the crossing place was a broad ford. Equally feasible, though, is the belief that the name came from several early settlers who were of Scottish origin, particularly the Isle of Skye, which has a place called Broadford. One of the first recorded settlers, Reay Clarke, married Elisabeth McKenzie of the Isle of Skye in 1843. There is also a physical resemblance between the two Broadfords, having a stream valley flanked by a prominent mountain. Much of the Broadford district is occupied by hilly forest, the Tallarook and Mount Disappointment State Parks. Consequently it was not rapidly settled for rural purposes, despite its proximity to Melbourne. An Anglican school was opened in 1857, three years after the Broadford township was surveyed. About 12 km south-east of Broadford gold was discovered at Reedy Creek in 1857. The mining brought more people to the district. Hotels were opened at Broadford (1859) and at Reedy Creek (1861). Presbyterian and Anglican churches were opened in 1861 and 1862, and the Broadford District Road Board was proclaimed in 1862. It was the forerunner of the shire council which was created on 9 March 1866. The shire included the villages of Strath Creek, Tyaak and Clonbinane. 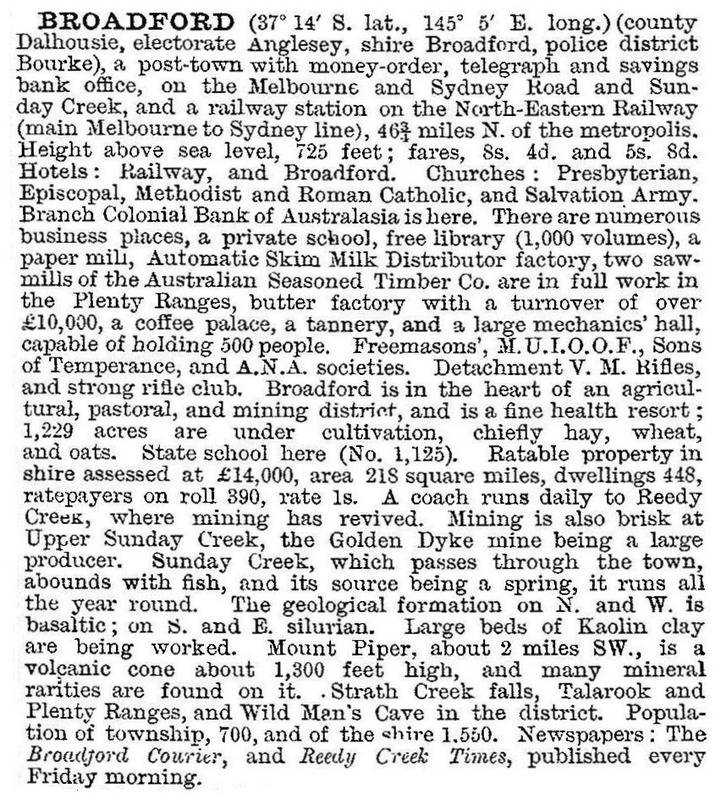 In 1862 a flour mill was opened near Sunday Creek, and functioned until wheat growing moved to northern Victoria. In 1889 another mill was opened nearby, Victoria's third paper mill. The proprietor was linked to the stationer and publisher, Sands and McDougall. The main product was strawboard, used for book covers and cardboard boxes. 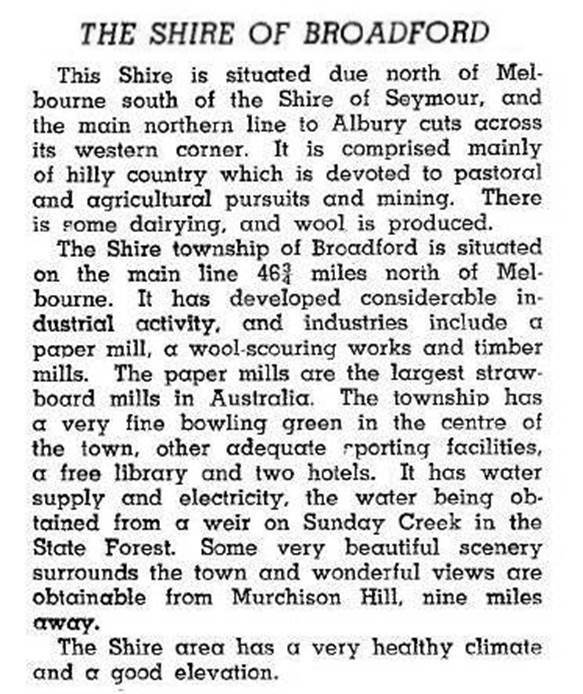 In 1896 the Broadford mill was amalgamated with a mill at Fyansford (Geelong), and the new entity became Australian Paper Mills Co Ltd (APM). In 1960 a high school was opened in Broadford. Thirteen years later the mechanics' institute hall, long a social centre for the town and district, was demolished. Its demolition more or less coincided with Broadford gaining a dormitory role for workers who commuted to metropolitan Melbourne. Access to metropolitan workplaces by the Hume Freeway has accounted for Broadford's growth of population, but the town's commercial area remains dependent on other households: commuters have tended to shop near their workplaces, taking advantage of larger shopping centres with a wider range of merchandise and cheaper prices. During the 1980s the shire council commissioned studies for Broadford's manufacturing and tourist potential. A key issue has been finding a tourism image. The absence of historic structures has caused tourist promotion to lean towards the State forests and sporting events. A grand prix standard motor cycle track and the Broadford Athletic Gift provide important events. Broadford has a golf course, a range of sporting clubs, two ovals, a swimming pool, State primary and secondary schools, five churches and land for industrial growth. Local employment was badly affected in 1997 by the closure of the Amcor paper mill. On 18 November 1994, most of Broadford Shire was united with Pyalong Shire, most of Seymour rural city and part of McIvor Shire to form Mitchell Shire. The shire's head office is in Broadford. In 2013 Victoria’s state planning minister released a planning blueprint that signaled population and employment growth in rural towns including Broadford. In 2014 Broadford primary school had 334 pupils and Broadford secondary college 619 pupils. E.H. McDonald, Country life: a history of Broadford and district 1891-1981, Broadford, n.d.